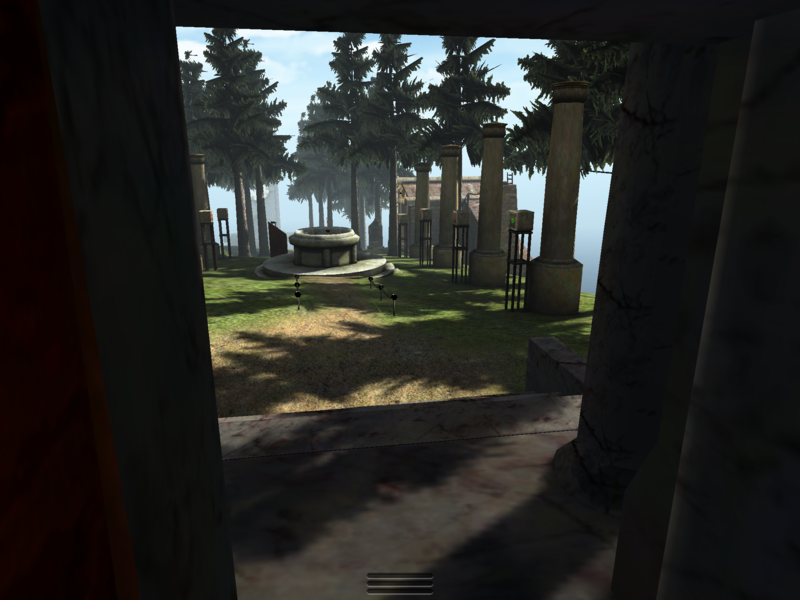 As promised, Cyan's port of RealMyst for iPad has just hit the iOS App Store. It's very pretty -- of course; albeit with the slightly simplified RealMyst world. (The original Myst allowed arbitrarily detailed images, but a 3D engine has to count polygons.) This is probably at the limit of what the newest iPad can handle. Load times between Ages are pretty awful, and even moving between rooms induces a second or two of delay to load new textures. However, that aside, walking and looking around are quite smooth. The skies and ripple-animated water look fantastic. The only missing graphical element (so I am told) is the day-night lighting cycle in some of the Ages. The interface is good; I wouldn't say it's perfect. The basic model is "touch to walk, drag to turn, tap to interact." The gestures are blurry, however. If you try to walk (touch-and-hold) but your finger slips a little, it gets recognized as a drag, and you just turn very slightly while standing still. This is extra-confusing because you're used to being able to turn and walk at the same time. (That option is labelled "advanced" but it's the default.) So you feel like you should be in that mode, but your feet are stuck, because of a tiny difference at the beginning of the gesture. The game also supports running (double-tap and hold) and walking backwards (two-finger hold). Wisely, it introduces these one at a time, rather than throwing you a big control list at startup. That's all good. I also noticed some nice guidance for walking down twisty hallways; the engine tries to keep you from getting stuck in corners. Things get blurry again when it comes to interactive elements. Myst has always been ad-hoc about interaction -- you tap buttons and doors, but drag switches. This extends up to being a puzzle element, with discoverable variations like tap-and-hold or tap-and-wait being clued by the environment's behavior. The distinction between tap and drag was always cued by the mouse-cursor, however. That worked in the desktop world. 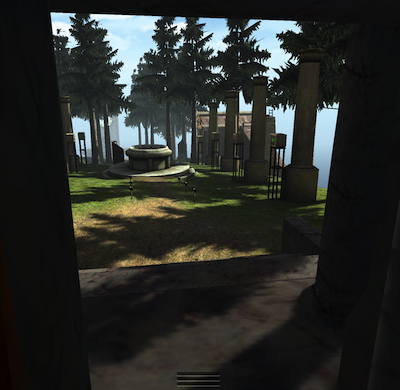 It didn't work so well in iOS, as I said of the original Myst iOS port, and it's even worse now. In a 3D animated world, you really want to drag doors open and closed, drag wheels around. (Amnesia: Dark Descent got this very right.) RealMyst mostly doesn't allow that, and the few draggable levers just set up a false expectation. Really, this port should have gone farther. Myst has several combination locks that offer a row of digits, and a button below each digit to cycle it. This is a familiar model (and popular in room escape land) -- but it's a legacy of mouse-game design. In a touch world, you should drop the buttons entirely, and just let the player drag the digit-wheels up and down. As I said in a post a while back, you cue interactivity by having the wheel jiggle when tapped. But I'd better drag this post out of the sucking mire of interface design natteration. Should you buy RealMyst? Again? You've probably already decided. It's not like we haven't all faced the question before. I think of these occasional app purchases as an irregular donation to Cyan, which is fine -- I've gotten my few dollars of value just wandering the island this afternoon and reminiscing. [...] We've gotten so much feedback from fans and friends encouraging us to do it... We've really go only two issues... First - what product to propose (it's between two - one Myst related and one completely new)... Second - we need to get enough money from realMyst to fund a good Kickstarter proposal... with some great artwork and a convincing video. You may ask, what, they need to raise money in order to raise money? Depends what they're going for. Jmac and I did my Kickstarter video on a shoestring -- but there was equipment involved, which Jmac conveniently had. And at the other extreme, you figure that Neal Stephenson probably spent a fair pile making that Clang video. Cyan will be aiming at the high end, if they're sensible -- so yeah, it takes money to raise money. And no, I don't really care what kind of game they're fundraising for, as long as it's a new work. The Myst universe is comfortable. They can go back to it if they want. That risks seeming anticlimactic if they try for yet another dramatic climax for Atrus's family -- Uru and Myst 5 pretty well drained that reservoir. But there are plenty of historical corners left to explore. Contrariwise, if they try a brand-new setting, that would be cool too. Sounds cool enough. I always thought realmyst should have come along a decade later. 2012's realtime 3D would have been amazing on a game like myst, would probably look better then the original. Myst seems ideal for a modern, completely kickass 3D showoff because in comparison to Riven it's still pretty simple graphically. I doubt you could make a %100 percent perfect realRiven with today's tech(although the starry expanse folks are giving it their all) but a modern, extremely high-quality realMyst sounds like a great idea.